Yoonshin Song (the 1st price winner of the 1st Stradivarius International Violin Competition), a 25 year-old violinist, has recently won the Second Prize in the 25th Lipizer International Violin Competition in Italy.At the same time she was appointed as a winner of the Special Prize for the best performance of a Paganini Caprice. She accomplished her Master's Degree in Violin Performance and currently started a Graduate Diploma Program at the New England Conservatory. 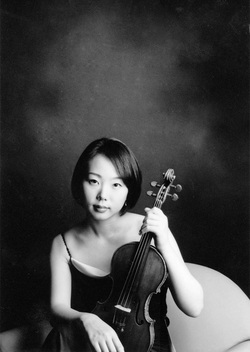 Born in Seoul, Korea, Yoonshin Song began playing the violin at age 5. As a young artist, Ms. Song has performed numerous recital programs throughout the U.S, Europe, Japan and Korea. Her debut recital was given by winning the Jeunesses Musicales Audition in 1999. She also gave her several recitals sponsored by the Kumho Foundation by winning the Kumho Young Artist Audition. She came to the states after graduating from Seoul National University in Korea, where she studied with Min Kim and Young Uck Kim, and she accomplished her Bachelor Program. She has been studying with Donald Weilerstein at NEC since 2004. Yoonshin Song won numerous major competitions in Korea such as the Dong-Ah Music Competition, Joong-Ang Music Competition, Nan-Pa Music Competition, KBS Young Artist Competition, and Busan Music Competition before she came to the States. Internationally, she was awarded the 2001 Henry Marteau International Violin Competition in Germany, and Second Prize at the 2003 Wieniawski International Violin Competition in Poland. Yoonshin Song made herself known abroad through giving numerous solo recitals such as Seoul National University Association Concert Solo and Chamber music recitals in 9 different cities of the state. She was also invited to the Katzen Hall opening concert in Washington D.C. in 2005. In Germany, the German press has called her a ‘Diva on Stage’. Yoonshin Song is expected to give recitals and performances for 2007-2008 in Italy and Korea. Currently, she is playing on an Amati (made in 1600)’ which is on loan from an anonymous foundation.